Standard Thread – Using up my supply of Gudebrod 10/0 and then will shift to Veevus 14/0. Spooled on a Ekich Bobbin. 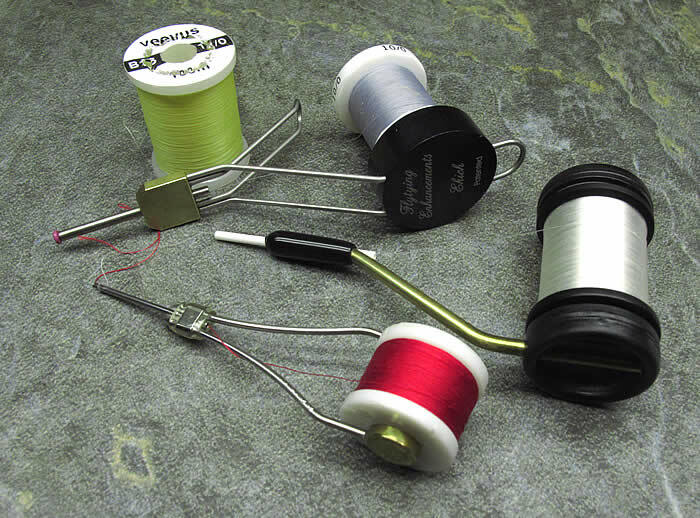 More I use this bobbin for tying trout flies, the more I recommend it! Finest Thread – such as Uni 17/0 on a Rite Bobbin. Of course on a Matarelli Bobbin, some Pearsall’s Gossamer silk. Uni is nice, but heavy. I do use the 8/0 for spinning deer hair. I have been disappointed in the spooling quality of Griffith’s. Bennechi is nice, but does not work well with the Ekick Bobbin. Admitedly, I have not done a through test, but though I have some of the new Wapsi-UTC thread and Veevus, and now I am moving towards Veevus as my default, as it proving to be fine and strong.